Use Product Options to Select Handpiece and Power Cord: K.8301-2 has H.30 Handpiece, K.8303-2 has H.44T Handpiece, K.8304-2 has H.20 Handpiece, K.8323-2 has H.43T Handpiece, K.8324-2 has H.8 Handpiece, K.8325-2 has H.8D Handpiece and K.8327-2 has H.28 Handpiece. Power Cord Options: North American -2, United Kingdom -21, Continental European -22, Continental European CE -22CE, Australian -26. Flex Shaft Tool Sets include popular combinations of motors, speed controls, and handpieces - the three key components of a complete flexible shaft machine. Unlike our Pre-Packed Kits, they do NOT come with any accessory assortments, but do include a tube of grease. The K.8301-2 is the only set that comes packed in a printed box. All other sets come packed in a white box. 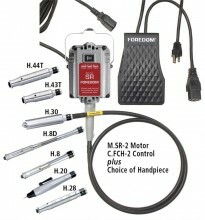 230 Volt version of Foredom's most popular and best motor for general use. The 1/6 HP, ball bearing, hang-up style M.SR runs in forward and reverse at speeds up to 18,000 RPM. It offers substantially more power than any of our older universal motors - 66% more than Series CC and 33% more than Series S and old SR motors. It comes equipped with a motor bale for hanging and our standard 39" long key tip inner shaft and outer sheath for connecting to any of Foredoms interchangeable handpieces. 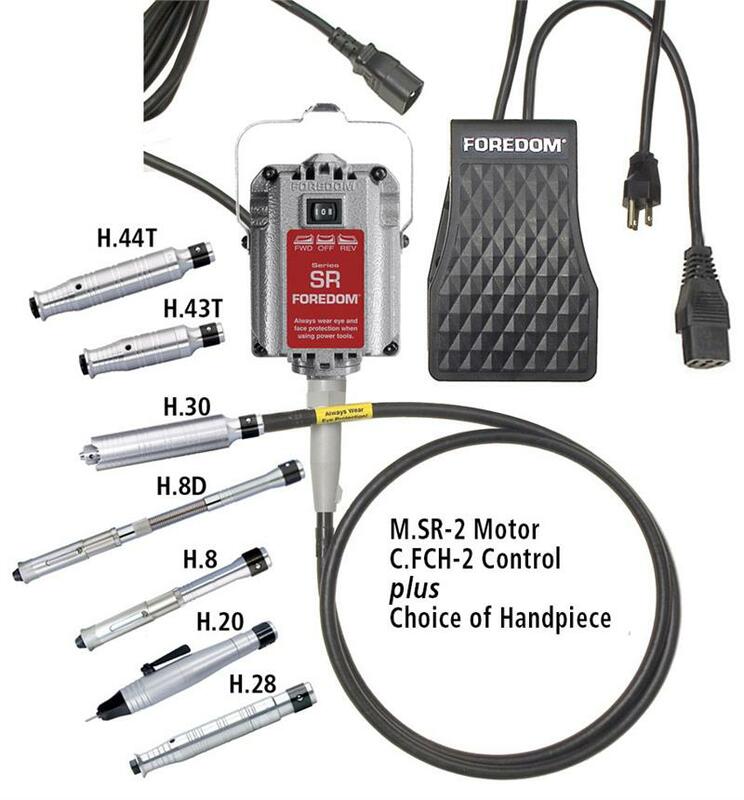 Click the button below to add the SR Hang-Up Motor, Foot Speed Control- M.SR-FCT, Choice of Handpiece to your wish list.